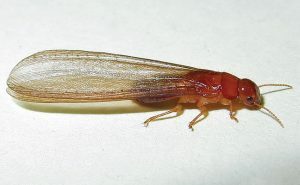 Mike Edelen, a wood-destroying organism (WDO) inspector at Thrasher Termite & Pest Control of So Cal, Inc. in San Diego, Calif., recently discovered a new colony of Formosan subterranean termites in La Mesa, half a mile from the original 1992 outbreak of this destructive, invasive species. Conclusive identification of Coptotermes formosanus was made by Thrasher Termite & Pest Control in cooperation with the San Diego County Department of Agriculture and the California Department of Agriculture Plant Pest Diagnostics Division in Sacramento, Calif.
“It was clearly evident that these termites did not behave like native subterranean termites,” says Garrett Thrasher, owner and general manager of Thrasher Termite & Pest Control. The homeowner first noticed a potential problem when a cloud of winged insects swarmed their yard at twilight. Those winged insects turned out to be adult Formosan subterranean termites seeking mates. Formosan subterranean termites were last seen in La Mesa in 1998. It is unknown whether this population is related to the previous infestation.